Ohio was the 17th state to ratify the Constitution, doing so in 1802. But it was a rough process, full of political and geographical challenges, not to mention military struggles against the original inhabitants. What we now know as Ohio was originally populated by Native Americans of several tribes, including the Delaware, Miami, Mingo, Ottawa, Shawnee, and Wyandotte. Some of these tribes had more of an influence on the eventual European settlement of Ohio than did others. The most notable figures were Tecumseh, The Prophet, and Little Turtle. Tecumseh is perhaps the most famous of the three. Chief of the Shawnee, he spoke for many other tribes. When Europeans began settling in and around his villages, Tecumseh sent word to his neighboring tribes, in hopes of reviving what was once a powerful grouping of Native Americans, the Western Alliance. Faced with little support from his neighbors, he went on a journey, trying to enlist tribes (specifically, the Chickasaw, Choctaw, and Creek) from other areas to stand together with him, marking the Ohio River as the line across which Europeans would not be allowed to cross. Tecumseh had left his brother, Tenskwatawa (The Prophet), in charge of things, with the specific instruction that no attacks on Europeans were to be made until Tecumseh got back. 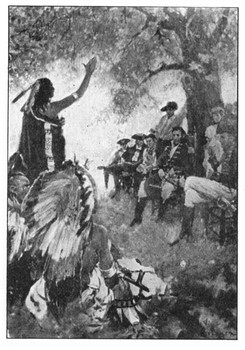 The Shawnee chief wisely saw that he didn't have enough men to defeat the European settlers. The Prophet disobeyed his instructions and gathered a war band at a place called Tippecanoe. On November 7, 1811, The Prophet led his men into battle against the Americans, who were commanded by Indiana Territorial Governor William Henry Harrison. The result was a resounding victory for Harrison and his men. When Tecumseh returned and saw what his brother had done and also what the Americans had done, he was angered beyond belief and determined to fight the Americans at every turn. One Native American chief who was very successful at stopping American settlement in the Ohio Territory was Meshikinquah, or Little Turtle. The head of the Miami nation led a coalition of Native American warriors who were adept at defeating American settlers. In one famous battle in 1771, he and his men massacred an American force under the command of General Arthur St. Clair, who was also Governor of the Northwest Territory. A force of 1,000 Native Americans attacked a force of 1,300 Americans. Little Turtle and his men killed 602 Americans and wounded 300 more, while losing only 66 dead and a handful injured. It was one of the most devastating defeats ever by Native Americans over Americans, three times as many dead as under General George Armstrong Custer at the more famous Battle of Little Bighorn. In response to this, American General George Washington sent General "Mad" Anthony Wayne and a force of 2,000 men out to the Ohio Territory. This decision ultimately turned the tide, since Little Turtle, seeing the superior numbers coming at him, decided to talk peace. The other tribe chiefs in the coalition that Little Turtle led, however, didn't want peace. 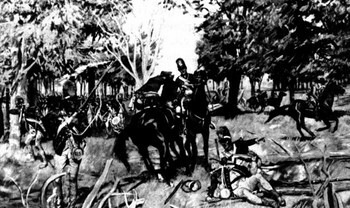 They continued the fight, and this resulted in Wayne's victory at the Battle of Fallen Timbers">Battle of Fallen Timbers. Little Turtle, who had been relieved of his command of the coalition, did not fight in the battle. As a result of the battle, the Native Americans were forced to sign the Treaty of Greenville. Little Turtle continued to preach peace and even met George Washington eventually. The once-powerful Miami chief died in 1812, in Fort Wayne, India.